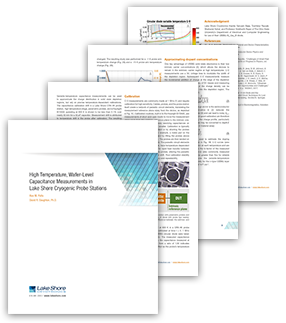 In this new app note, we explore the use of a Lake Shore CRX-4K cryogenic probe station equipped with our parametric probes and a high-temperature stage for making wafer-level capacitance-voltage (C-V) and capacitance-frequency (C-F) measurements at variable temperatures up to 600 K.
Such types of variable-temperature capacitance measurements can be used to approximate the charge distribution in solid state depletion regions, but they also rely on precise temperature-dependent calibrations. Lake Shore Development Engineer Alex Potts explains in the app note how these capacitance calibrations can be done so drift can be minimized even with the inherent thermal gradients in a cryogenic probe station. The resulting calibrations and C-V measurements, in turn, are used to confirm an ultra-wide bandgap diode’s doping density at several temperatures. In "device characterization, hall effect, nanostructured materials, semiconductor research"